We have been supporting a number of projects in Kenya since 2013: Outreach to the Maasai people, a bus ministry out of Narok, and support for a number of local “evangelists” by providing some of them with a combination of farm land, livestock, seed, clothing, medical assistance, and support for orphans, transportation (motorbikes) as well as opportunities to generate income. 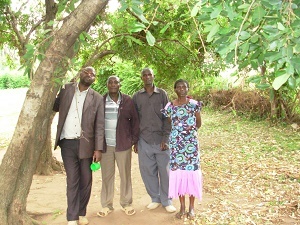 Two of these early evangelists are Javan Bokea, and Zipporah Gesare Otwori who is heavily involved in our next major project, the Ogiek people. Mark Hawkins, Director, Vice-President Outreach Ministries - Kenya, initiated and is in charge of all For We Care Projects in Kenya. Ogiek History: There is a big controversy on the origins of Ogiek with some earlier scholars thinking that they were remnants of some pre Maasai people who occupied the Rift Valley and adjacent areas. The first mention of the Ogiek in published literature was by W. A. Chandler who noted their unique physical features and thought that they were different compared to other tribes. Historians indicates that Ogiek are original inhabitants of central Rift Valley leading to a feeling that only Ogiek have at least a claim to be aboriginal East Africans since there is no evidence of them having come from elsewhere. Ogiek Social Structure: They lack corporately organized formal institutions. They have no chiefs, clan leaders or formal councils. 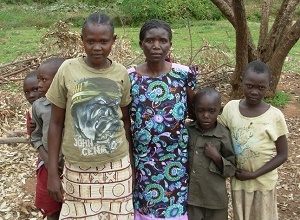 The Ogiek are isolated from other tribes. The ancestral Ogiek land was declared to be forest reserve by the Kenyan government and there was an effort by the military to forcibly evict them. They burned many houses and people were killed. Also lumber companies want to cut down the trees. The loss of ancestral lands has resulted in poverty, illiteracy and poor health. Recently some ancestral land rights were granted to the Ogiek. They also lack cultivation skills and the few who are peasant farmers are exploited by middlemen when they seek to sell their produce. 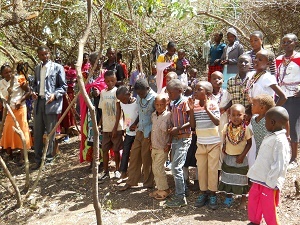 Our Present Challenge: Gesare writes: Our Kenyan churches are committed to the Ogiek people who are an isolated marginalized minority community. They were worshipping other deities in decaying communities. Salvation has arrived with the gospel of Jesus Christ which defends the weak and treats every person equally offering hope, encouragement and support. The strategy is to lead as many people to Christ as possible, then recruit leaders within our congregations to help both spiritually and materially. We are willing to delegate the work to them and give plenty of opportunities to put their God given talents to full use. Once they catch God's vision they will volunteer to help lead the church into a better future. We are committed to preach the undiluted gospel to the Ogiek people. We will volunteer to reach as many of the Ogiek people as we can. It is our humble prayer that every Ogiek soul will not perish because of not being told. To achieve this we are partnering with the Ogiek indigenes people who have already accepted Jesus to act as a pivot for the gospel to go far and wide. Presently about ½ of the people who hear the gospel of Christ accept Him as Lord and Savior and receive the Holy Spirit and water baptism. The population in the area we are working in is approximately 40,000 souls. The church there is now growing rapidly and we have 3 area churches plus evangelism. We presently have 2 Pastors and their families, a nurse and a helper, Sister Rael, and myself (evangelist Gesare) with a helper. These people love the Ogiek sacrificially, working long hours for little or no pay, living mostly in temporary tents year round. We also support 6 Ogiek men in a two year Pastors course in our Bible school. We set up a special oral training course for them since they don't read or write. In addition, we support 3 bright Ogiek orphans at Bishop Javan's house with a view to send them to a good boarding school leading to a profession such as a lawyer so they can represent their people to the government. Above all we need prayer for God's help and direction. We need the services of more evangelists and pastors to offer both long term and short term pastoral care. To achieve this, we also need financial help with the volunteering pastors and evangelists to get food, clean water, clothing, tent and a means of mobility or transportation.